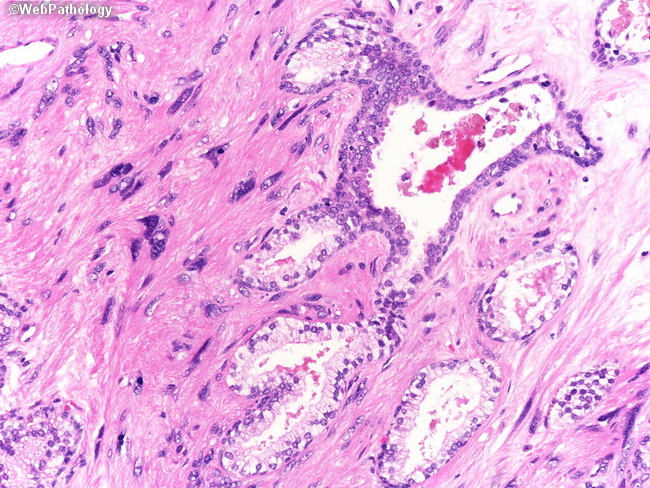 Higher magnification of the previous image showing atypical stromal cells in between benign prostate glands. The nuclei are hyperchromatic and vary considerably in size and shape. Mitotic activity is not increased. STUMP is considered to be a benign stromal neoplasm with an overall excellent prognosis; however, a small number of cases progress to stromal sarcoma which mandates close follow-up of all cases.